The Ophir L50(300)A-IPL energy sensor shown above when used in GEL mode is designed to measure the energy output of IPL type sources coupled to the patient's skin with optical index matching gel. The sensor has a large Ø65mm aperture with a glass window having an antireflection coating on its rear surface. The IPL source is placed on the window with gel coupling to eliminate the reflections of the top surface of the window. Since it is only a small distance on top of the absorber, even radiation a large angles reaches the absorbing coating. The sensor absorbing coating is of the LP2 type that has high absorbance, high damage threshold and low angular dependence. We are interested in displaying the energy emitted by the IPL source assuming gel coupling to the patient and no back reflection from the patient's skin. This means we are displaying the entire energy emitted from the IPL source. The transmission of the glass as a function of wavelength and angle. 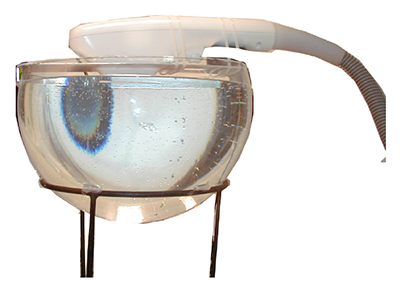 In order to measure the IPL light source spatial light distribution, a hemispherical container was made filled with water. The tip of the handpiece was immersed in the water thus eliminating back reflections even for rays coming out at high angles. The energy was measured at various angles on the surface of the hemisphere both parallel to the long side of the source, perpendicular to it and in between. This was done for IPL sources from 3 different vendors. There was found to be no major difference in light distribution in the various azimuth directions and the light distribution with angle for the three IPL sources tested was found to be as in the left graph below. In our calibration calculations, we take the distribution to be an average of the measurements as shown in the right graph below. Note that past the critical angle of about 42 degrees, no light is transmitted by the glass whereas in a gel coupled IPL, all angles will be transmitted. Since we calibrate the IPL sensor using a pulsed 755nm laser and the measurement involves a spectral distribution of light typically from 600 to 1000nm, we also need to know the spectral distribution of the IPL source. This was determined using a calibrated spectrum analyzer. Since there is only a weak dependence of calibration on the spectral profile, even if the profile of a particular IPL source differs from the one below, the calibration is not affected much. 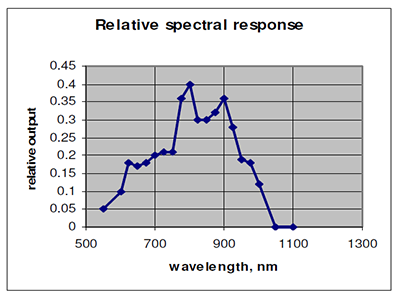 The measured values of the angular and spectral absorption of the LP2 coating are shown below. Note the small dependence on angle and wavelength. Below left, we see the transmission of the glass as a function of angle. Note that at the critical angle of 42 degrees, the transmission falls to zero. Note also that the spectral dependence below right is small except at the shortest wavelengths. We measured the output of the IPL source with a different type of Ophir IPL sensor, the Ophir model L40(150)A-IPL which uses a pyramidal light guide and which had been independently analysed and calibrated in the past. The aperture of the DB type sensor is 22x22mm so the IPL source of 10x48mm was checked to see if its output was uniform over the surface and the measurement was adjusted to compensate for the fact that only 22/48 of the output was measured. The L50(300)A-IPL as calibrated using the calculated calibration factor read within 2% of the DB head. The L50(300)A-IPL as calibrated using the calculated calibration factor read 2.6% lower than the same head when the laser was in direct contact with the absorber surface. From all of the above, we are confident that this method can determine the true calibration of an IPL source within +/- 6% or so and also that it is not particularly sensitive to the parameters of the various machines. What Are the Special Requirements in Measurement of 193nm Radiation? Can Ophir pyroelectric sensors measure single shot energy or energy at very low repetition rates?